This 100-hour Veterinary Assistant program introduces students to the exciting and growing field of veterinary medicine. Students will learn about the care of animals as well as how to recognize signs of illness and disease. This program also covers interpersonal communication, interaction with clients and their animals, as well as how to assist the veterinarian during examinations. Administrative duties, such as fee collection, banking, and accounts payable are also emphasized to provide the student with the skills necessary to maintain an efficient front office. Students will enjoy learning through classroom lecture as well as hands on labs. Note: this program does not include a national or state certification or a clinical rotation as part of its overall objectives. In addition to classroom lecture and labs, this program includes a clinical externship through a local provider. 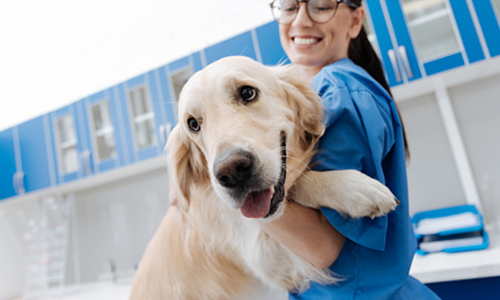 Clinical Externship: Upon successful completion of this Veterinary Assistant program, you will be eligible to participate in a 40-hour clinical externship with a local provider. You may be asked to submit to a thorough background check, drug screening and meet other requirements. Times: 9:00 a.m. – 4:30 p.m.
Click Here for the Online Veterinary Assistant Program?